Even complete strangers can do the pamamasko. Before it was only children who do this, now, even the not so young do the same thing. People would go house to house, knocking at the doors asking for Christmas gifts and hoping for the generosity of the owners of the house. If parents or guardians accompany the children while namamasko on every house, it is ok. Unfortunately, what happens is that adults are the ones asking for pamasko and take advantage of the holidays, minus the kids. 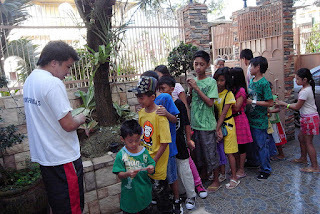 Christmas in the Philippines sometimes blur the lines of pamamasko and begging. In the Filipino Culture, asking for pamasko while you're a child or with a child is ok, and people will be glad to give whole-heartedly. If an adult is the one asking pamasko, people would have second thoughts, not unless they first sing a few Christmas songs. Although Christmas is for all ages, aguinaldo and pamamasko is supposed to be exclusively for children. If you're an adult already, you should be counting what you can give instead of what you will receive during the Holidays.